Thank you for choosing Thornton Town Center Family Dental as your local Thornton dental provider. We are happy that you chose us to help you achieve the beautiful and perfect smile you have always wanted. Our dentists are experienced, trained, and talented, so your dream smile is only a call away. Below, we want to take a moment to talk to you about a newer procedure that we offer in our office and it is known as pinhole gum rejuvenation. If you have never heard of it, that is okay. We know that you will enjoy this procedure, should you need it because it is much better than the traditional gum grafting procedures that are offered. We invite you to take a moment to look over the most commonly asked and answered questions about the procedure below. Should you have a question or if you want to schedule an appointment in our Thornton office, call today. What exactly is the Chao Pinhole technique? The Chao Pinhole technique is a specialized procedure that is offered by our experienced and trained dentists. The procedure works to repair any shrinkage of the gums that you may have experienced in your mouth. The treatment starts with a small pinhole in the gums and the gums will then be moved around without any cutting or surgery. One of the most important things to know is that many patients can benefit from this procedure, they just do not know that it exists or that they need it. Prior to the pinhole procedure, did patients just live with the shrinkage or did they seek out treatment? Before the pinhole treatment option, the only option was standard gum grafting and this procedure could be painful, timely, and leave you with cuts in the mouth that needed to heal. Some patients would seek out treatment, but most would forgo the treatment to avoid the negative side effects associated with the traditional graft. If a patient did not opt for a graft, they may have chosen to have a filling placed in their mouth to cover up an exposed tooth root. Is a standard gum graft different than the pinhole procedure? Yes. The standard gum graft takes a lot longer than the pinhole procedure, as the standard procedure requires that the gums are cut from the palate and then grafted where extra tissue is needed. This requires multiple incision sites, which means a patient may need to care for two surgical wounds in their mouth and the risk of infection is greater. The process to cut the gums, remove the tissue, graft the tissue, and suture the area can take as long as one to one and a half hours for one to two teeth. Patients will need to heal for two to three weeks after the procedure is done too. What makes the pinhole surgical treatment option better? The key to this procedure is that you do not have to have a graft. The gum line is restored when the dentist makes a small pinhole in the gums using a special needle. There is no cutting as all and you do not have to worry about a scalpel. Once the pinhole has been made, the tissues are shifted around appropriately. You will experience no trauma to the tissues and there are no wounds to deal with. You will find that this is a minimally invasive procedure and one of the least invasive out of all dental procedures offered. The pinhole is only visible on the gums for one day as there is enough collagen and blood vessels in the area to ensure healing happens quickly. How long will the results from the pinhole procedure last? The results are not meant to be permanent and will not last your lifetime. With that said though, the results will last for many years if you are healthy overall and you brush your teeth properly. The risks are very minimal when compared to other routine dental procedures. No. This procedure is not meant to cure gum disease and will not. The treatment is designed to provide patients with a restoration of the gum line and is ideal for patients who have a receding gum line. Prior to treatment, all gum disease must be treated and eradicated before. If the procedure is done concurrently with the procedure, then you may be at higher risk for infection or complications. Why do you offer this procedure at Thornton Town Center Family Dental? This procedure is offered here in our office because our dentists saw a need for it. The procedure allows patients to restore their gum line without the pain, time, and cutting that was traditionally required with a graft. How expensive is the pinhole procedure? The cost of this procedure is quite comparable to that of a traditional graft, however, you do not have to experience the long downtime, pain, or cutting. If you would like to know if your insurance plan covers this treatment or you would like to discuss a payment plan with us, call our Thornton office today. 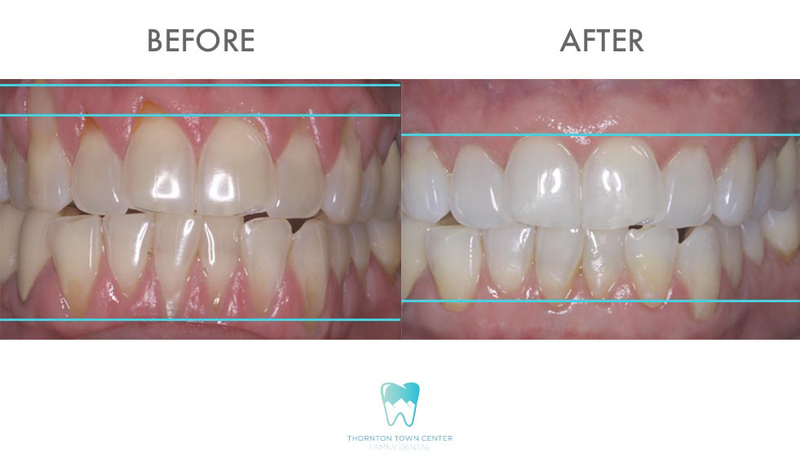 If you would like to learn more about our pinhole technique or procedure or you would like to schedule a free consultation with our dentists, call Thornton Town Center Family Dental today. We offer this procedure and other restorative procedures in our Thornton, CO office.